I am a nigerian citizen who loves travelling and eating and learning. I am currently taking up my Masters in Biochemistry and Molecular Biology at the University of Bayreuth and thus reside in Bayreuth, Germany. What am I professionally ? 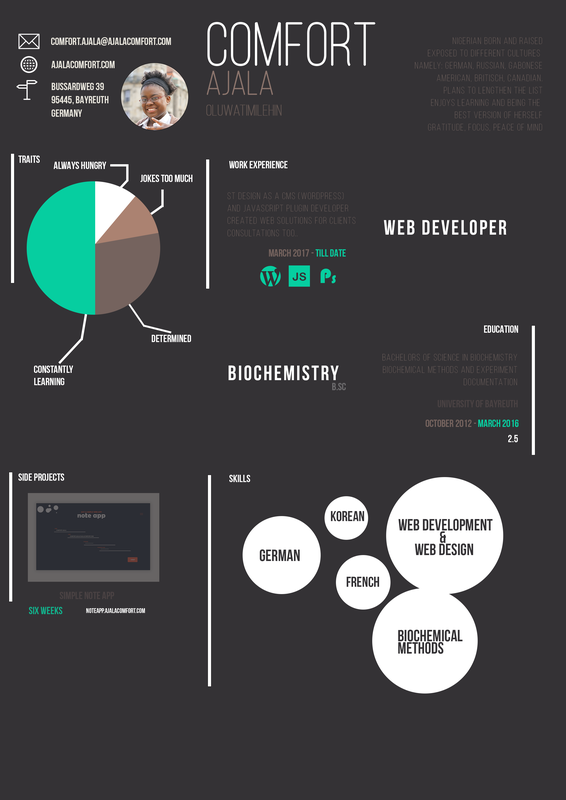 I have worked for ST Design part-time as the lead Web Developer but currently work for the University of Bayreuth at the Biomaterials Chair as the Web Developer. What can I create, with what I know already ? I can turn Photoshop designs into actual websites with full security and maintainable code. Web applications such as Dashboards for existing websites or for server file control are also included to the list. Where can I be found ? What have I worked on ? Asides my trivial codepen projects , I do have projects hosted online, which are listed below. Note that due to the hosting services I use (Heroku), it may take some time for the server to come up and load the page. So be patient *awkward grin*. What am I currently doing ? Am I available for hire ? Yes and No. Since I am still at school, working full-time or relocating will be difficult for me. But if you have a position start October 2018 anywhere in Europe, send me an Email beforehand. What positions am I open to ?